The Machachi Meat Market is located in the town of Machachi, 35 km south of Quito, Ecuador. This picture was sent in by KW. He writes: "The town of Machachi... is off the beaten track, and you are unlikely to see a foreigner there. Its central market is mostly in the open air, but the meat market has its own building which includes separate male and female facilities. 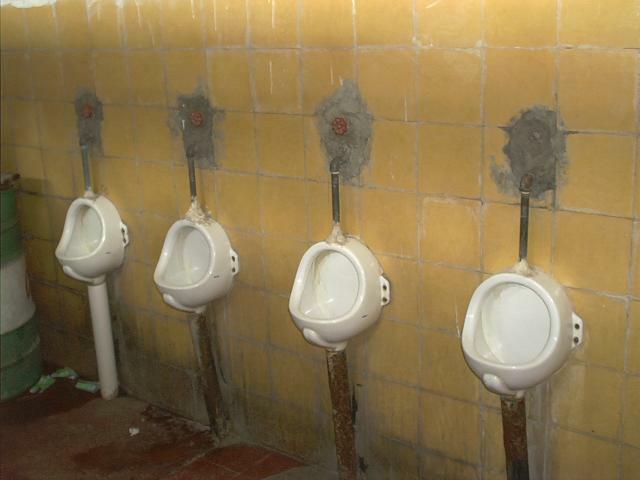 As typical in this country, anyone walking past the entrance will see the urinals. In this case there are six, of which four are shown here, and you pay the female attendant 5 cents to use one."